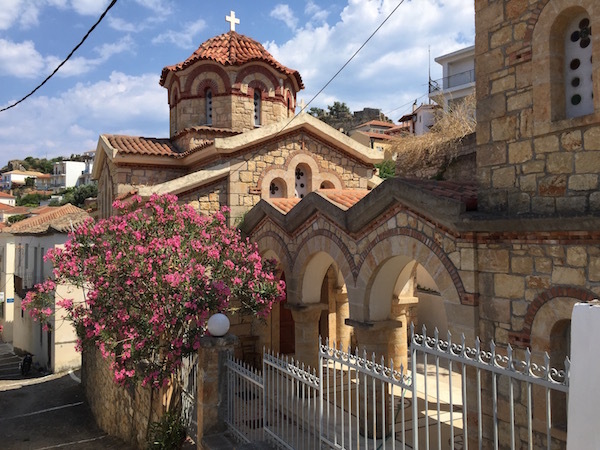 Our initial outline plan for this trip was ‘head south to the heat’ and therefore we thought why not edge a little further south in the Peloponnese. 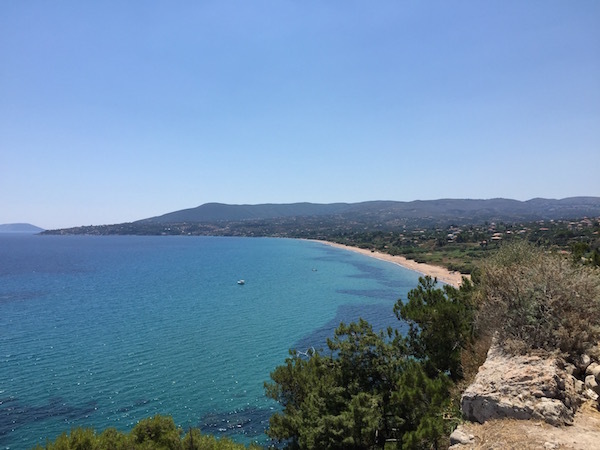 We picked a place on the map, as a half way stop over point Koroni, that our guide book said had little to offer other than a castle above the harbour town and a good sandy beach. Google maps showed us it was a quite picturesque and traditional looking harbour town. We hoped it would have more character than the holiday destination feel of Kastro Beach. It was very much as we had pictured it and turned out to be a great place to explore for a few days from our selected campsite on the hill, just a 10 minute walk along the road or beach into the harbour part of town. 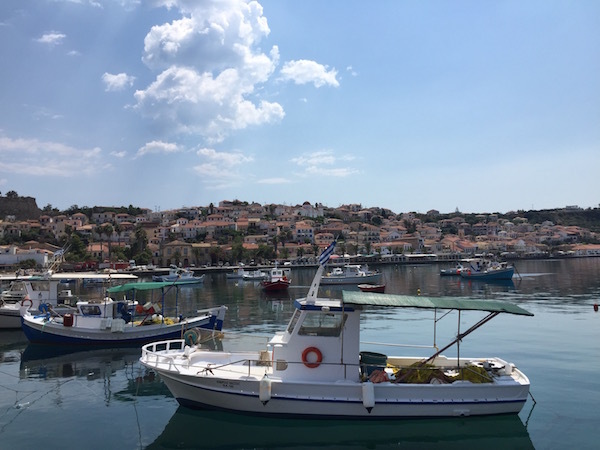 As with most of these sheltered coastal harbours, as well as fishing boats, there is normally a line of restaurants along the quay, set up for the flotilla of touring yachts that drift through throughout the summer. 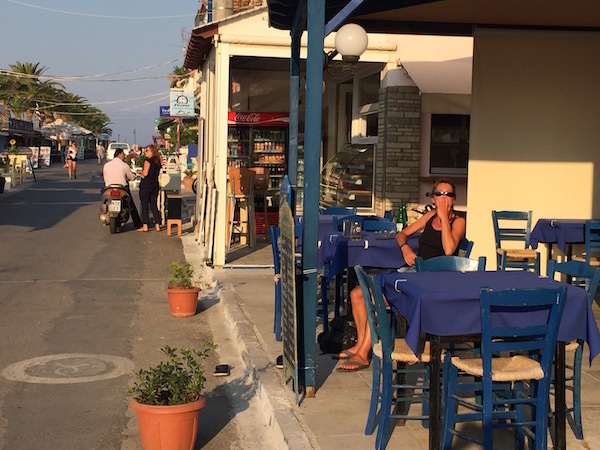 Even in this small town a dozen places offered pizza, seafood, gyros or simply beer. 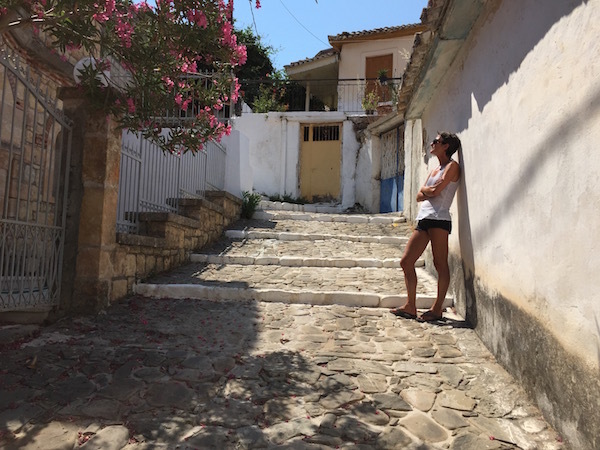 During our brief stay we chose our favourites; a quiet little taverna where we were only ever joined by locals and a grill restaurant away from the harbour where the owner gave us his recipe for his delicious potatoes roasted with lemon. Our absolute favourite though, an Ouzerie open on one side onto the church square, where we joined local men on Friday night for a couple of ouzos, and on the other side to the sea front where locals and tourists mixed to enjoy Ouzo Mezedes. Avoiding the umbrellas of Zaga beach, a long sandy beach which would otherwise be beautiful, we walked up to the castle which was not surprisingly completely void of tourists at midday. We learned later from the Turtle Protection Society, camped for the summer on the same site as us, that turtles choose Zaga to come ashore and lay their eggs. We could join them a 6.00am for the routine patrol if we wanted! 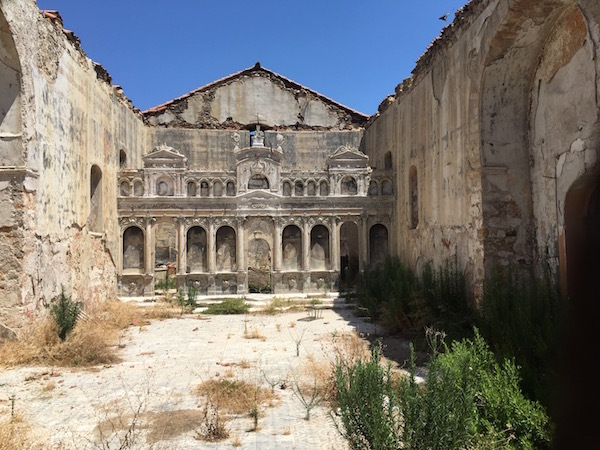 The castle was more a collection of churches within its walls, abandoned and crumbling and a few immaculately maintained, frequently used and very spiritual feeling churches. On the outer edge, facing out to sea, several small cottages leaned against the outer walls with access to the small plain on the cliff top via an ancient stone archway. 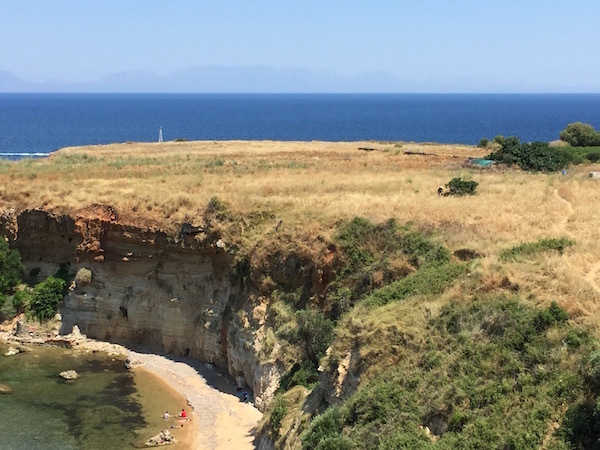 As we watched a shepherd tend his goats in the shade of an olive tree on the dry plain, we noted the extreme contrast of his day versus those laying on the secluded beach below. 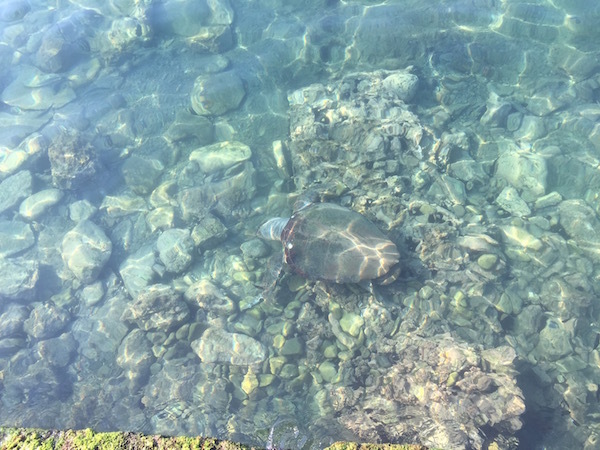 On our way back through town along the harbour side, we were distracted by a few people pointing noisily at something in the water and where amazed to see a huge turtle slowly paddling around in the shallows between rocks in the harbour. We snapped an picture on our phone knowing that we couldn’t possibly take an image that would represent its beauty and incredible size but we wanted to capture this precious moment. We excitedly reported back to the bronzed teenagers manning the Turtle Protection campsite. “Oh yes, he visits regularly” they said, which deflated our moment a little but made us feel good about the healthiness of the sea in this part of the Mediterranean.